Did you just notice a lump or bump on your foot that you know wasn’t there yesterday? Are you finding that shoes are causing too much pain to wear? It is possible that you are suffering from a bone spur. While some spurs can cause a noticeable lump on your foot, others are not obvious, other than the pain they cause. Bone is a living tissue and has the potential to change over time. Many of these changes are erosions due to arthritis, however some are extra, abnormal growth of bone called bone spurs. Bone spurs commonly occur around the small joints of the toes, which causes increased pressure between the toes and cause soft corns to form. Another common area for bone spur growth is the top of the foot, especially over the great toe joint. This results from repetitive stress to the joint caused by years of walking. Pressure from the bone spur, also called a dorsal bunion, causes the surrounding soft tissue to inflame when it contacts the shoes. 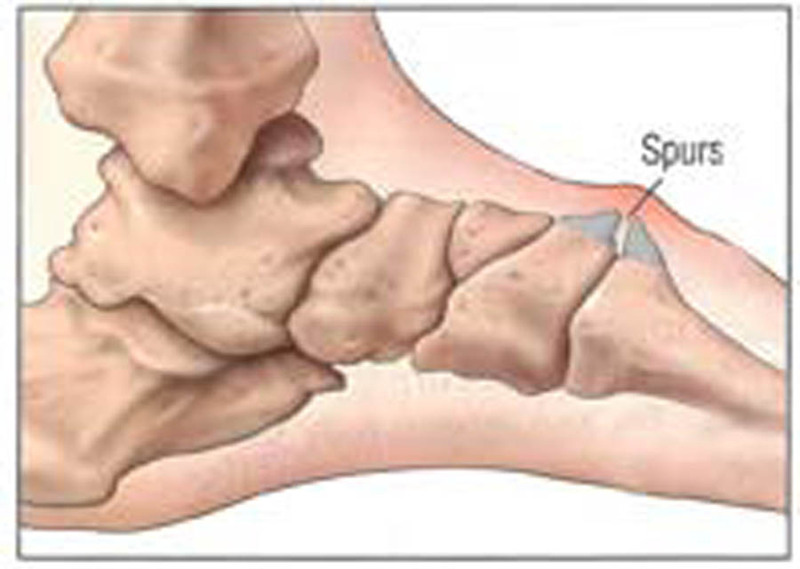 Heel spurs are bone spurs on the bottom or back of the heel bone. They form due to pressure from the attached tendon or ligament as they pull on the heel. Although commonly present in other syndromes such as plantar fasciitis or Achilles tendonitis, they are usually not the primary cause of the pain. Only in cases of unrelenting pain do these spurs have to be removed. Treatment for bone spurs includes padding, change in shoegear, injection therapy, and custom orthotics. In cases, where more conservative therapy does not alleviate the pain, surgical removal of the bone spurs would then be an option.